11 gauge walls with six bays of bracing and Tapered for Guy or Bracketed installations. The 55TGIA is available in the standard 10 foot section length. 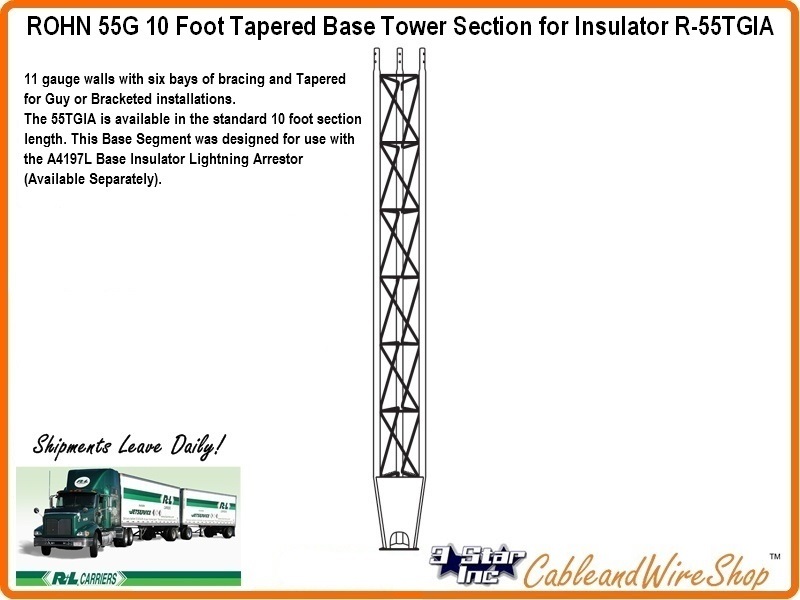 This Base Segment was designed for use with the A4197L Base Insulator Lightning Arrestor (Available Separately). This tower uses double bolted joints which are proven to be the best method of joining tower sections for sturdiness and dependability. Featuring a 17 inch equilateral triangular design, the 55G is constructed of extra heavy duty 1-1/2 inch steel tubing side rails with continuous solid steel rod bracing. Each 10 foot section is shipped containing all required nuts and bolts attached to one leg. The 55G tower can be used guyed, self-supporting or bracketed configurations according to specifications in the ROHN catalog. As a guyed structure, it can rise to a maximum of 400 feet. Consult ROHN Catalog Links at Footer Section below for ROHN 45G Tower Details.